We are really in the swing of things now and enjoying summer in Pono! Jon Burgos returned for another wrestling class on Tuesday. This time he led the children in breakdowns and escapes on the mat. Or in non-wrestling terms, he guided them in trying to knock another wrestler down to a weaker position and learning to avoid that scenario by creating distance to escape. The children enjoyed strategizing their moves with Jon! Our littlest Pono friends had a special treat this week with two musical visits from Julia Foote. 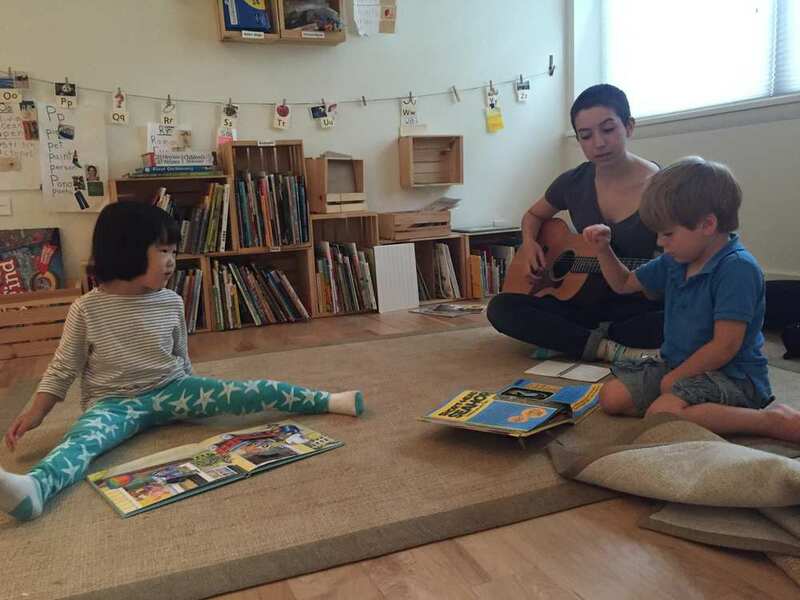 Julia brought her guitar and kicked off Tuesday’s class with a fab rendition of “Yellow Submarine." She and the children then put their own spin on a number of well-loved songs. 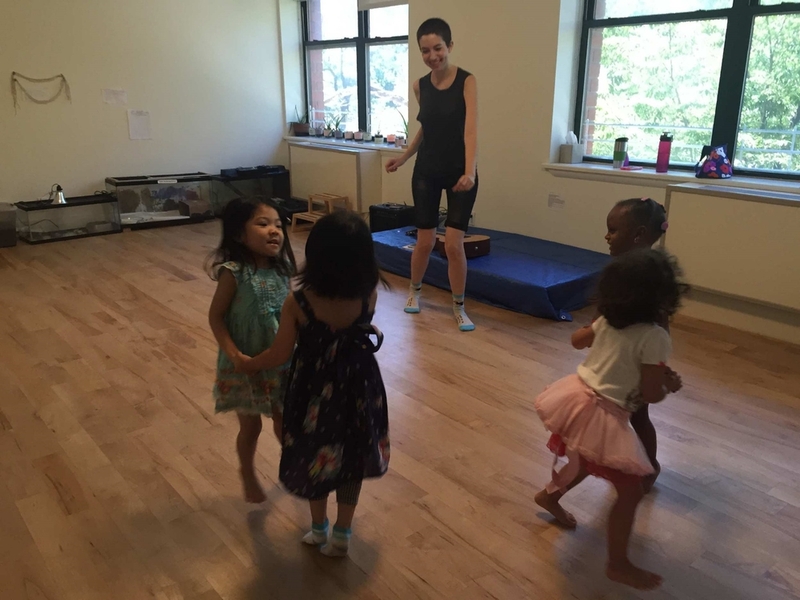 Milai led us in singing “Bananas and Sushi” to the tune of “Apples and Bananas!” On Thursday the children enjoyed more singing with Julia and ended class with an exuberant dance party. Pharrell Williams’ “Happy” really got everyone moving! This week Julietta had an appointment that required her to miss group literacy. However, through a stroke of good fortune, a mysterious visitor arrived: world-renowned word detective, Shirley Holmes! (You guessed it: Sherlock's worldly, wordy cousin!) 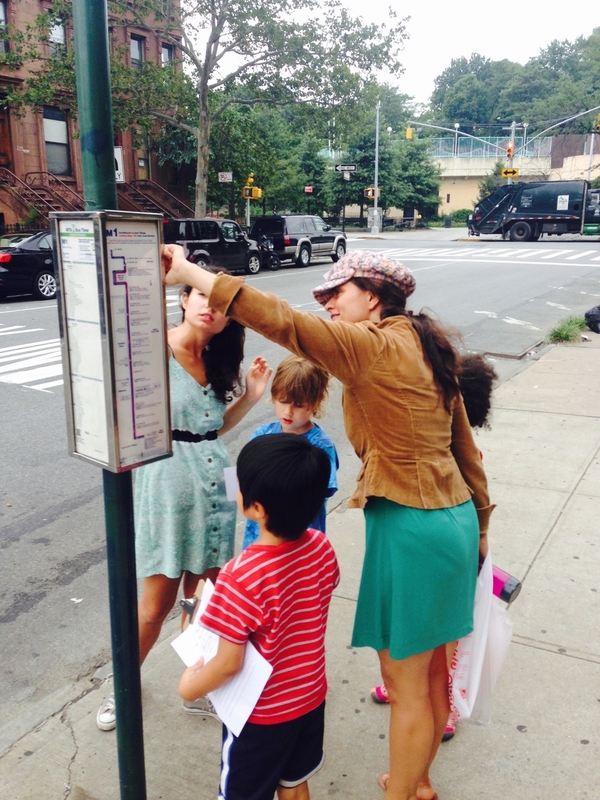 Scotland Yard had tasked Shirley with solving some neighborhood word mysteries and, remembering how helpful Pono children had been the last time she was in town, she appealed to them once again for help. Our Pono detectives-in-training happily obliged! Through context clues and sounding out and jotting down interestingly disguised words, many local word mysteries were solved. However, some pieces of the puzzle are still missing. Hence, Shirley may yet return to complete her mission, so keep your detective senses ready and stay tuned! In Math and Cooking with Maysaa, we made an Almond Milk Berry Smoothie. Tsofia declared it the second best smoothie ever! Before we added ingredients to the blender, the younger children used strawberries to represent tens and blueberries to represent ones. They started with the number 98 and subtracted their way down to 0 while eating the tens (strawberries) and the ones (blueberries), a few at a time. The older children worked with quarters, dimes, nickels, and pennies to find out whether they had enough money to get a smoothie. Luckily they all had just enough and everyone enjoyed their smoothies! We had plenty of outdoor education this week with three field trips! On Monday we took the subway downtown to CW Pencil Enterprise, a true “only in New York” type of shop that specializes in…you guessed it, pencils! Caroline Weaver, the shop’s owner, opened her store just for us that day and welcomed us warmly. She and the shop’s manager, Caitlin Elgin, invited us to try out a variety of pencils at the pencil testing station and let us use different sharpeners. We even held a 23-karat gold-plated sharpener! Caroline also explained the steps in making a pencil. A highlight of our visit was when Caroline brought out her vintage Kingsley hot foil machine and demonstrated how to stamp words on a pencil. She asked us for ideas and we came up with “I love to write and draw,” which she then embossed on a pencil for each child. Caroline also generously stamped a personalized "Pono" pencil for each child as a souvenir of our visit. 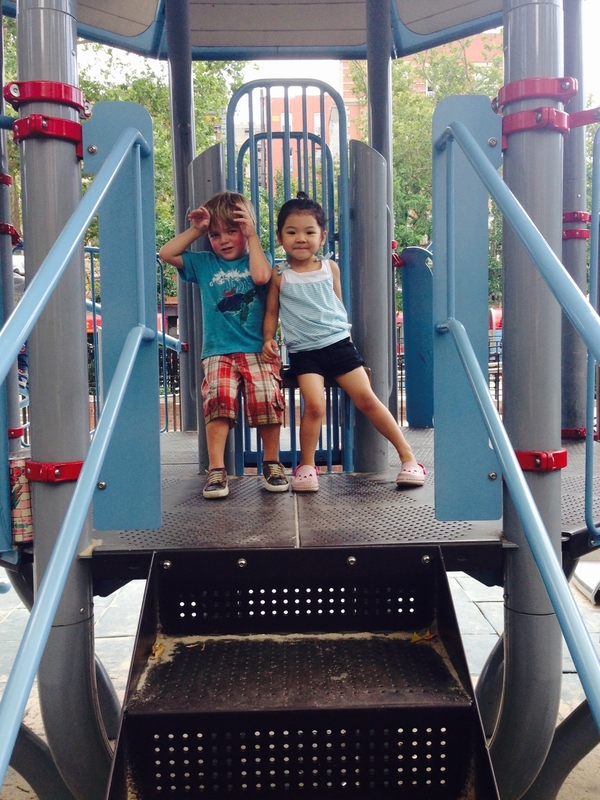 After saying goodbye to Caroline and Caitlin, we walked down the street to Chinatown’s Hester Street Playground, where we ate lunch in the shade. The children then scaled the jungle gym, built sand forts, and splashed in the sprinklers. Lots of summer fun! 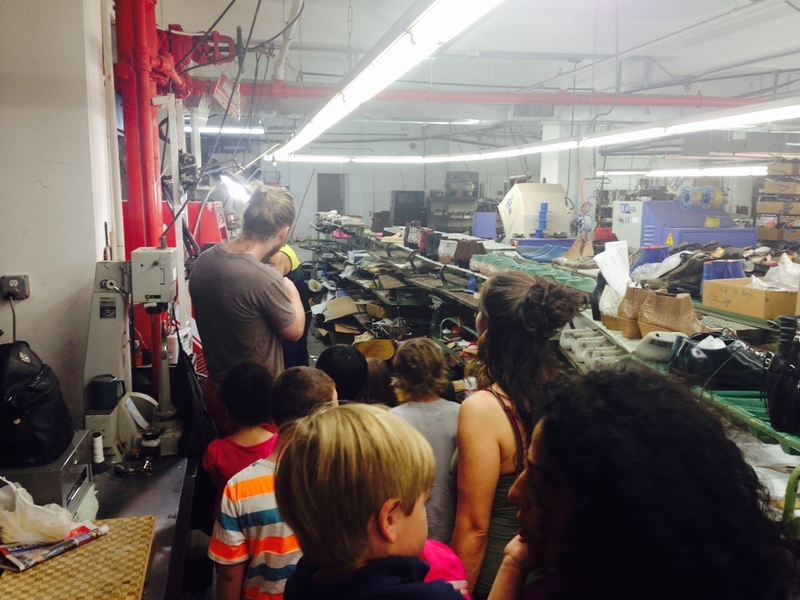 On Wednesday we headed to the Garment District and visited Modern Vice, New York City’s only remaining shoe factory! Founder and designer Jordan Adoni greeted us and explained how his father's New York shoe business had inspired him to start his own factory in NYC. Our guide, Kenny Kline, invited us to explore the showroom, where we oohed and ahhed over a variety of funky designs. Next, we entered the photo studio and peered down its “infinity wall” and then passed through a bookcase/secret door into “The Shoebox,” a glass-walled event space complete with dance music and disco lights. Kenny then led us to the fabric room, its shelves bursting with hundreds of different types of leather. He also showed us various soles, heels, and lasts, or molds for making shoes. 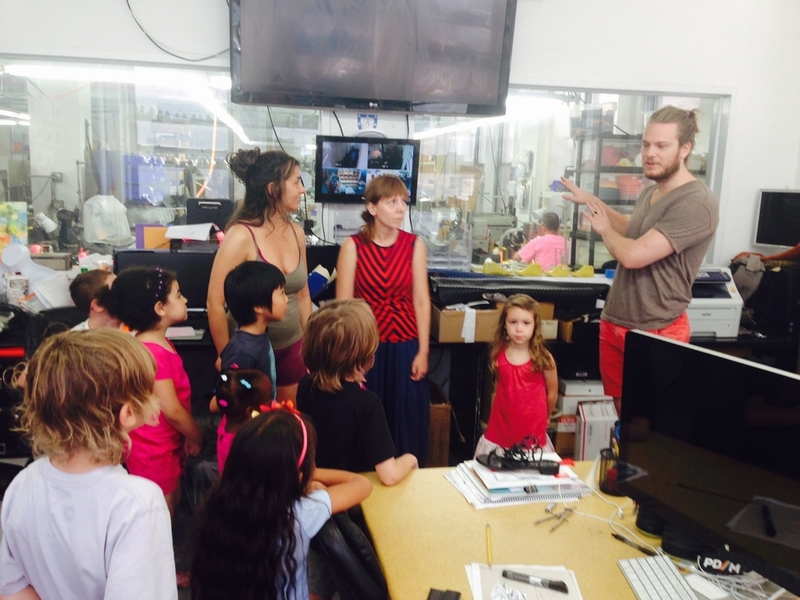 Kenny walked us through the steps of the shoe making process, and we met cobblers cutting patterns and sewing leather. Before we left, Kenny showed us several of the factory’s more unique designs, including colorful flats for Google employees and a size 22 shoe, custom made for Shaquille O’Neal! We walked from the shoe factory to Bryant Park, where we ate lunch near the park’s famed “Le Carrousel.” After lunch, the Pono friends had a treat, two rides on the carousel’s colorful animals! We spent the rest of the afternoon enjoying activities in the park. 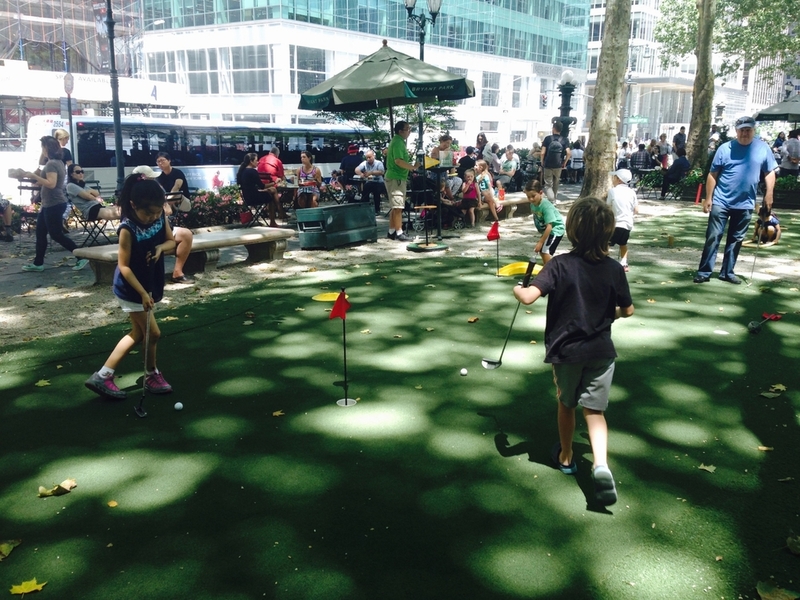 The children took turns practicing their golf swing at the five-hole putting green, and some of them tried their hand at Kubb, a Scandinavian game similar to lawn bowling. Others chose to join Julietta at the park’s outdoor Reading Room, which has a number of children’s books. On Thursday we all ate lunch al fresco in the 123rd Street Community Garden. It was the perfect setting for a summer picnic, and the children delighted in exploring the lush garden. 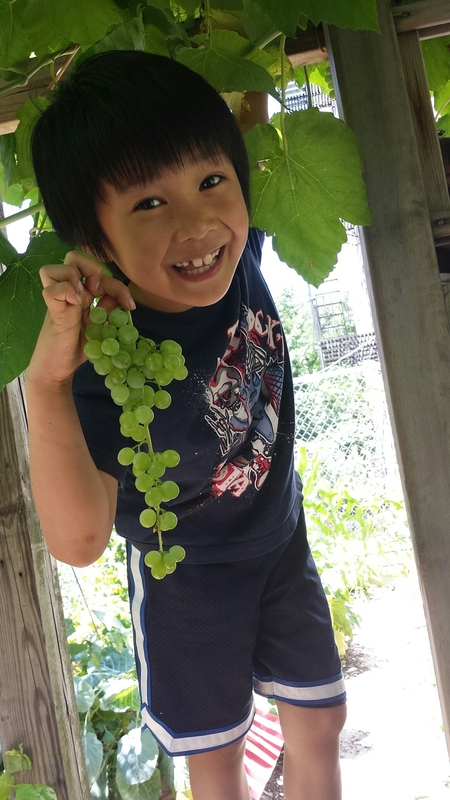 They discovered an abundance of tomatoes, peaches, grapes, and even horseradish. Bodi had brought his nature guide and identified a cabbage butterfly fluttering among the plants. Lila and Zuri happily tended the garden with a play lawnmower and set of tools, and everyone basked in the sunshine. From the garden, we walked to Frederick Douglass Boulevard and visited Harlem Flo, a local flower boutique filled with artistic flower arrangements in striking vases. One of the owners, Louis Gagliano, welcomed us and explained how the shop gets its flowers from around the world. He also gave us advice on caring for flowers and answered our questions about the variety of blooms in the shop. We admired lilies, onion flowers, ginger flowers, roses, and the delightfully named Teddy Bear sunflowers. We even got to smell cacao pods! Before we headed back to Pono, Louis kindly gave each child a marigold to take home! This week Poppy Luca led the Comic Book Friday class and helped the children develop their drawing skills with a number of activities designed to expand their visual art "tool-kit.” First they explored emotion through facial expression and how to convey an emotion though visual illustration. The group also looked at the use of shading and tonal variation to create the illusion of volume or depth. They briefly touched on using geometric shapes to describe their comic book characters and then went on to do a full body portrait of the characters that the children had previously invented. The children experimented with large-scale drawing using black ink and white paint to "correct" any lines they weren't happy with and at the same time keep the shadows of these lines as a little history of the drawing.